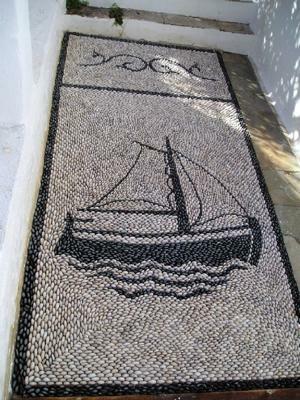 This mosaic pebble sail boat is in beautiful Rhodes island Greece. It is over 6 square meters in size. I collect all the pebbles myself from the beach. It is made directly on site right on the floor. I have more of these pebble mosaics scattered all over here in the islands of Rhodes and Symi in Greece.